Two are of the Conway Scenic Railroad in New Hampshire back in 2009 when they were still running their FP-9A units. These engines are streamlined cab units based on a design that dates back to before World War II. The Conway Scenic operated these units on the former Maine Central Railroad Mountain Division between North Conway and Fabyans, NH. They were wearing out brake shoes on a regular basis, and as a result, they were traded to PanAm Railways for two freight locomotives with dynamic brakes (similar to the regenerative braking on today’s hybrid cars) to reduce maintenance and operating costs. Take a trip back to the 50’s and listen to the sounds that defined passenger railroading for a generation. 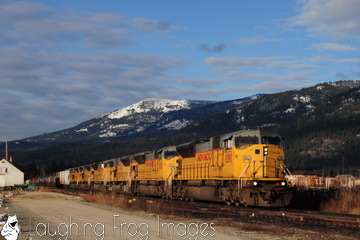 The third video is a little more contemporary from 2011, showing a Union Pacific freight train with six SD9043MAC diesels in Sandpoint, WA on a train northbound from Spokane, WA to the Canadian Pacific Railroad in British Columbia. We invite you to take a few minutes to check them out. There will be more short videos of New England railroading in 1994 added as soon as we figure out how to use the new video software we just acquired. Happy New Year and stay tuned!